Two of the "littles", my word for grandkids are visiting. They've been here since Valentine's Day. I looked for something that was easy to make, and is delicious. 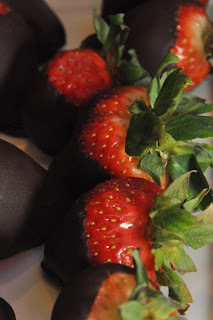 Dipping strawberries in dark chocolate is super easy, and is definitely delicious! I did the first strawberry, and the 6 year old and 8 year old did the rest! Get the best dark chocolate you can - 70% cacao is my favorite! Stealthy Cooking Tip: Dark chocolate is a rich source of antioxidants. In addition, the saturated fats in chocolate don't elevate cholesterol levels. Chocolate can be a healthful addition to a well rounded diet, however a key word here is well rounded. Enjoy a piece of chocolate every once in a while!